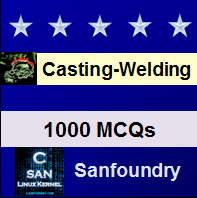 This set of Casting, Forming and Welding Multiple Choice Questions & Answers (MCQs) focuses on “Bonding Theory”. 1. Which of the following is not a bonding theory? Explanation: Hot strength theory is not one of the bonding theories, while electrostatic theory, surface tension theory and block and wedge theory are bonding theories. 2. In which of the following bonding theory, water molecules break down to form H+ and OH- ions? Explanation: In electrostatic bonding theory, water is mixed in clay and sand grains, these water molecules then break into H+ ions and OH– ions. 3. What does the clay particle absorb in electrostatic bonding theory? Explanation: The OH– ions are basically the base ions. The clay particles in electrostatic bonding theory, absorb the OH– ions because of the not satisfied valence bond. 4. For bonding action of clays, what is the amount of water needed? Explanation: For the bonding action of the clays, water is needed, which activates the sand and clay-sand mixture. The amount needed for this is 1.5% to 8%. 5. What is the amount of sea coal needed in cast irons for small casting moulding sands? Explanation: In bonding of substances, an extremely small quantity of sea coal is also needed. Sea coal is used for surface appearance improvement. It is used about 1% in cast iron moulding sands for small castings. 6. What is the amount of sea coal needed in cast irons for large green casting moulding sands? Explanation: Sea coal otherwise is used in small numbers for binding. Sea coal is used for surface appearance improvement. It is used about 10% in cast iron moulding sands for large green casting sands. 7. At what temperature is pitch distilled from soft coals? Explanation: For pitch distillation of soft coals, a decently high temperature level has to be attained. From soft coal, pitch is distilled at a temperature of around 600°F and a by-product called Asphalt is produced. 8. Pitch maybe used up to what percent? Explanation: Pitch distillation of soft coals plays a vital role in bonding theory. Pitch is used for getting a good surface finish on iron casts. These pitches generally are used up to be to 2%. 9. Which of the following increases the dry strength of the sand? Explanation: Dextrin and molasses are used for increasing the dry strength of the sand, which add hardness to the mould. 10. Cereals improve flowability and lower collapsibility. Explanation: Cereals do not improve flowability, as a matter of fact, it reduces it, and, cereals are not known to reduce or not the collapsibility, in fact it is known to improve it. 11. How much should fuel oil be added to increase the moulding ability of sand? Explanation: Fuel oils are known to have great properties in them. Fuel oils are helpful in adding to the increase of the moulding ability of sand. It can be added in the range of 0.01% to 0.1%.